Growing up on the East Coast meant my summers consisted of backyard barbecues, neighborhood block parties and swimming, lots of swimming. With each summer that hit, my aunt desperately tried to barbecue for us. But year after year on her charcoal grill, the food was black, hard, and inedible. Nobody could tell her that, so we sat and spoke for most of our barbecues, loud and proud to distract her as we threw the food away. Now, years later, there are a few tips she could have listened to, to up her non-existent barbecue game. For the love of meat everywhere, use one! These thermometers can save you hundreds of dollars each year on food, because they tell you when your food’s internal temperature is right. You just stab it, (gently), and it will give you a reading. The temperature depends on the type of meat you are cooking. All meats have different internal temperature guides to follow, to allow for safe food consumption. Pork is generally best at 135 degrees Fahrenheit, while chicken should be in the range of 160-165, and so on. a cooking technique that maximizes the use of your grill. 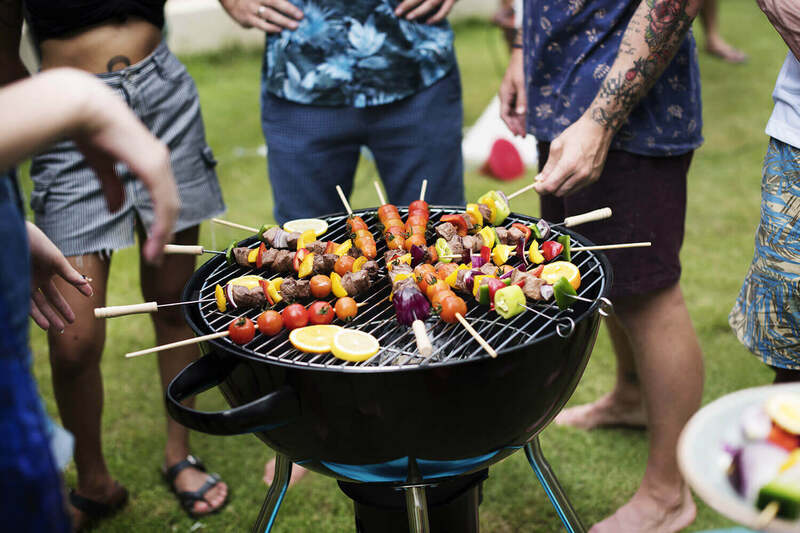 You, the chef, must first establish a “two zone” system, where, because of the placement of the coals, a part of your grill is hotter than the other. When choosing this technique, you mainly use the colder section of the grill. It doesn’t use direct heat, so the temperature is around 150 degrees there. Cook your food on that side, until it’s almost ready to be served. Just before plating, flip the meat onto the hotter part of your grill, sear it, and serve it. This helps keep all of that flavor locked inside the meat. Whether it’s a specific kind of meat, a side of vegetables or even fruit, know your meal! For meats, as stated previously, there is a temperature that the meat becomes safe to eat. Steak temperature depends on thickness, so a skirt steak (medium-well) should be at around 132 degrees, while a thicker steak (at medium rare) should be 130 degrees. Sausages are safe to eat at around 155 degrees, but be warned! The closer you get to 160 degrees and above, the drier the sausages get. Salt dries them out. It’s a great way to add flavor, but salt is a preservative, and draws out all the juices from the burger. Add other ingredients like black pepper, red pepper flakes, paprika, or garlic powder, for a boost of flavor on the grill. One time, to try to keep the burgers from drying out, we tried basting them in chicken broth— do not. Just trust me. Take the salt out of the burger instead, and keep that meat thermometer handy. A burger needs to be at 145 degrees for medium rare, so up the internal temperature for more well done meat. I know, nobody bought the grill to put bunny-food on it, but vegetables are a good source of vitamins and minerals. They can complement any meal and be a quick appetizer. Always make preparations for vegetables you might be cooking. Keep oils and dressings on hand, and always keep a vegetable grate nearby, in case someone wants carrots or asparagus, as they tend to roll around. To spice up your vegetables, try using different sauces. Garlic and oil, hickory smoke, Frank’s Red hot sauce– there are so many sauces out there that can turn your boring bowl of broccoli into a fiesta! When you make fish, you want it to be crisp and flaky in your mouth. However, it isn’t easy to accomplish. That skin keeps catching on the grill! My grandpa used to swear by water, but putting water on the fish never helped the texture or flavor. Some people use oil, but some people use mayo. Yes, you heard that right. Because mayo is literally a mix of egg whites and oil, it burns off the fish before it is done cooking, so you can’t taste it. You can, also, make sauces and put those on the fish as well, but they could stick to your grill and make clean up later a bit difficult. If you go with the sauce route, try using small amounts of it, and not just drenching the fish. Small amounts. I know you can do it! Hopefully you can now avoid the hockey puck hamburgers and overcooked chicken legs!